The Mules use Facebook as well as 3Mules.com website to share our way of life that we’ve been living for the past 35 years. We exercise the freedom to live outside and move freely in all directions, north, south, east and west, one step at a time all day every day as our ancestors have done along with the Grizzly Bear, Wolf, Elk, Deer, Lion, Salmon – long time companions that humans have lived with on earth for thousands of years. Over the years, we have seen this freedom under attack, with the Megatropolis expanding its borders into open space due to overpopulation, diminishing Earth’s natural resources. Freedom has been reduced with laws and municipal codes created that prevent freedom of travel by foot on public roads and that disallow sleepings outdoors in public space to rest for the night, such as California Penal Code 647(e). Our way of life is threatened with daily challenges. Our way of life represents freedom, which belongs to everybody. The Natural World that human beings must have to be and remain human is vanishing rapidly. Give your faith, hope and energy to this place at which time you connect to it and receive the magic and endless possibility of infinity. Contact your city, state and nation’s officials to seek balance with earth and its Natural World, and to create an interstate trail system connecting cities and towns for people traveling by foot, bicycle, horse and mule with places to stop and rest outdoors. A frequently asked question often received is how the 3Mules.com website and 3 Mules Facebook page got started and how is it maintained. The website started with a concept in my mind. When I was wandering Arizona, Utah, and Nevada, this idea of getting a website so people could understand when they saw us walking through the mountains, walking through neighborhoods, along highways and so forth and so on, they could get an idea of who we are, what we are doing, and how we live. It was to be a voice, a voice that we never had. It got me very interested and excited about the possibilities. So that’s where the website originally started. It started in my mind…where all things start. After years and years of wandering, we saw so much of the environment deteriorating around us we wanted to go to California and do something about it. So, we decided we would come to California. We left Arizona, proceeded to Nevada. We got to Eli, Nevada and turned west across the state of Nevada. We walked against strong winds all the way to Carson City, Nevada. When we got to Carson City, we did not have a website, but we did have one in our minds. Magically enough, in Carson City, we met a very nice lady where we stayed on her property for a week. As things turned out, her son built websites and knew how to do it. Her son built us a website. When we left Carson City, we had a website, but unfortunately, we had no knowledge of how to use it. We didn’t know the tools to buy, or how to use it. We were totally in the dark. We had the 3Mules.com domain name and the paragraph you first see when you get to the website, however the site remained in that condition for quite a long time. We entered California, went through Sacramento and down south to San Diego, where we stayed for a month before we decided to go up to the Rose Bowl in Pasadena. That night before we got to the Rose Bowl, we met a gentleman who got out of his car, introduced himself, and asked us the usual questions: Where are you going? Where are you from? What are you all about? After a couple of days talking to each other, we developed a mutual self-interest. He told us that he was a documentary filmmaker and he saw us as good material for a documentary. He wanted permission to film us. At that point, we said we would allow him to film our journey at no cost to himself and in exchange, we would get his assistance with the website and Facebook page at no cost to us. 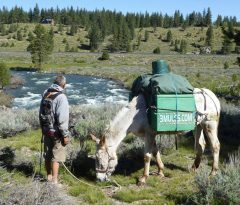 He filmed our journey for about two years, and helped with the 3 Mules website and 3 Mules Facebook page while doing so during this time. At the end of summer 2014 as we were heading to San Francisco, we needed horseshoes and posted on Facebook asking if anyone knew where we could find horseshoes. This wonderful energetic lady magically appeared with horseshoes. She then stepped in with her energy and skills to voluntarily run the 3 Mules website and 3 Mules Facebook page committing a tremendous amount of effort to that task. She’s been doing so since September 2014. She has been a Godsend to us (The Mules).